To ID or not to ID? Every election cycle we must endure challenges and allegations about fraud (conservatives) and discrimination (liberals) when it comes to voter ID laws. This year is no different. A federal court ruled that the Texas Voter ID law passed in 2011, requiring voters to present official photo identification, discriminated again poor, minority and disabled voters and ordered a judge to approve new interim rules for the Nov. 8 election. The new rules will broaden the list of acceptable forms of ID. Voters will now be able to present, among other things, an expired ID, a government check or a current utility bill. "Supporting documents don't have to have a photo, reports The Austin Chronicle, "but if they happen to, then voters will need to present the original. Otherwise, they can present a copy." 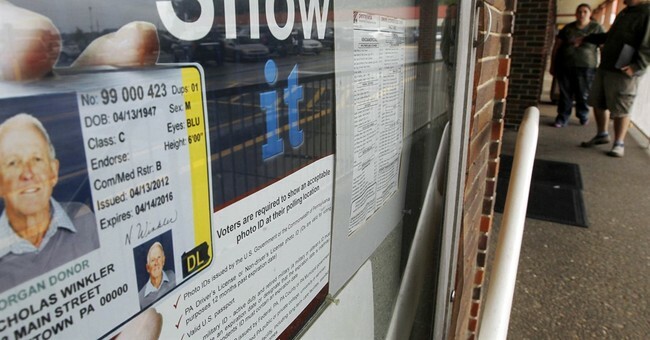 Similar battles over voter identification laws are being waged in other states, notably Wisconsin and North Carolina. It's worth reviewing the list of the seven forms of identification currently accepted by Texas law -- a Texas driver license issued by the Department of Public Safety (DPS); a Texas election identification card issued by DPS; a personal identification card issued by DPS; a license to carry a handgun issued by DPS; U.S. military identification card containing the person's photo; U.S. citizenship certificate containing the person's photograph; a U.S. passport. Granted, most poor people are unlikely to have a passport, but the state will issue any legal resident an identification card. Are civil rights groups who sued the state contending that poor and minority people are so inept that they can't apply for an identification card? If that is their position, how are they able to apply for SNAP (Supplemental Nutrition Assistant Program) benefits, which require a photo ID? Why is voting the one category in which you don't have to prove your citizenship and legal residence? I will answer that question in a moment. Three years ago during a similar controversy, Ashe Schow of The Washington Examiner compiled a list of 24 things that require a photo ID. You must have a photo ID if you are 25 or under and wish to purchase alcohol or cigarettes. Store signs say so. Want to open a bank account? Photo ID required. Here are the rest of the categories: applying for welfare, Medicaid and Social Security (presumably poor people take advantage of one or more of these programs); unemployment benefits (ditto); rent/buy a house, or apply for a mortgage; drive/buy/rent a car; get on an airplane; get married; buy a gun; adopt a pet; rent a hotel room; apply for a hunting or fishing license; buy a cellphone; visit a casino; pick up a prescription (or buy restricted over-the-counter medications); donate blood; apply for a license to hold a demonstration; buy an "M"-rated video game; purchase nail polish at CVS. Again, why is voting placed in a separate category? Why are liberal groups determined to repeal laws requiring proof of citizenship and residence? The answer is found in a definition of the word fraud: "deceit, trickery, sharp practice, or breach of confidence, perpetrated for profit or to gain some unfair or dishonest advantage." Since many poor people are receiving government benefits, they are responsive to Democrats' claims that Republicans want to cut them off, so they had better vote early and vote often, as the saying goes, or else. Notice the left never focuses on emancipating people from poverty. That might make the poor independent of government, which would be intolerable to the left. They need a reliable voting bloc and keeping the poor dependent on government is a modern form of slavery that is cynical in the extreme. Unless discrimination against an individual can be proved, these voter ID laws should be upheld. Otherwise, expect more votes from dead people, illegal aliens, people with false addresses and even Mickey Mouse. All of these scenarios have occurred in previous elections and are likely to be repeated in this and future ones without proper identification.